Don’t get me wrong, I’m a big fan of Bruichladdich. I think what Jim McEwan and team have done to bring back this distillery over the past decade and bring a new sense of innovation to Islay is nothing short of fantastic. In fact, I wrote this glowing recap of a tasting event with Jim late last year. But as a marketing-minded person, I must put forth my perspective that I am ultimately confused by the Bruichladdich identity. I can certainly respect their creativity and drive for innovation, but let’s get real – their products are all over the map. The only sense in the chaos are a few specific brands they have developed over recent years such as the Port Charlotte series, the Black Art series and the Octomore series. But the bevy of releases that get pumped out of the factory at breakneck speed is nearly impossible to keep track of. Seriously, go look on Bruichladdich’s website. They are currently advertising 35 releases. As an additional point of confusion, Bruichladdich is an Islay distillery that produces both peated and un-peated Scotch. So when you’re already sitting on dozens of releases that, in many cases, make little sense on their own, and then you throw into the mix the additional aspect that they may or may not be peated, you’ve created a recipe for complete and utter consumer confusion. On the 2011 Web Launch Limited Edition Renaissance release... And I quote: "The second of a brace of bottlings to mark the aquisition and re-birth of Bruichladdich distillery. Our manifesto for the future." - Oh right, it's THAT kind of whisky. The point of this post is not to rant. I’m just trying to make a simple point and ask a simple question. Bruichladdich is a cool distillery. I like the look and feel of their brand. I like their products. They make solid juice. But why complicate things? When I saw Jim McEwan speak, he talked about beauty in simplicity. While their products may be simple, natural, distillations of pure vision… their product line is anything but. I’m curious what you think. Are you intrigued by the range of choice and option or are you confused and frustrated by how hard Bruichladdich makes it to understand their products? 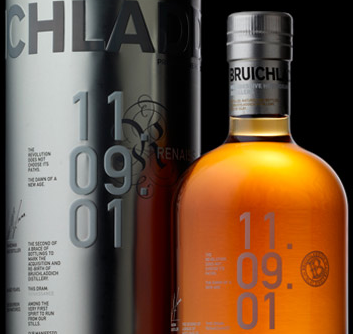 And, perhaps more importantly, do you think Bruichladdich’s approach is innovative or just a branding clusterf*%k? When we purchased the distillery in December 2000 the stocks we inherited were not equally spread over the years – and there was a huge gap when there was nothing at all. Undoubtedly, in order to overcome the gap in distillation, we were obliged to use our stocks in a strategic way; partly, the enthusiasm for discoveries unearthed, partly to optimise the value, partly to augment the quality, partly an eagerness to experiment. After all, we had a decade to survive until our own stocks came on line. In that time frame, indeed there was a proliferation of bottlings, with the confusion of peated whiskies released under Bruichladdich label, like Infinity. Over the last three years, as our own-disitlled stocks have come on line, we have been in a position to define our brand, clarifying things. For example, all peated whiskies from Bruichladdich are now under the Port Charlotte and Octomore labels. UNPEATED is added to Bruichladdich bottles. It’s one of those funny things: folk with a little knowledge assume Islay = Peat, yet those with a lot of knowledge know otherwise, and those with no knowledge at all, are blissfully unaware. With Coal Ila’s expansion, roughly 50% of spirit distilled on Islay is now unpeated. Peated whisky is not the prerogative of Islay alone, there is no appellation rule. There are several Speyside and Highland whiskies that are peated. Indeed, the only reason Islay remained a peat stronghold was because of its inaccessibility – it was too difficult to get coal there (until 1880) and peat was readily available. The economic demand for peated whisky was disproportionate for a little goes a long way in a blend (distillery bottlings did not exist then). Of course, producing peated whisky for blends does not have to be done on a far flung island any more; it can be centralised in uber-efficient distillofactories like Roseile. You will note from our delicious new website that our product portfolio is split in to Peated and Unpeated for clarification. To further simplify things, there are four categories in the unpeated section that are self-explanatory and reflect our work: Classic, Uber Provenance, Rare and Concept. Under these headings you will find the relevant whiskies grouped together – The Organic and Islay Barley, for example, under Uber Provenance. Sure, there are bottlings listed that we have finished (i.e. Organic 2003, Redder Still etc.) but the information is retained there for customers’ convenience for bottles may still be in the market place. There are, in fact, 12 ongoing, current bottlings. Now we are ten, our stocks have reached maturity, and we are able to streamline our bottlings, while producing larger ones. The final step of this growing up process and defining of Bruichladdich occurs this Autumn when we finally arrive at the Definitive Bruichladdich line up. All will become clear. Mark – I really appreciate your comments. And thanks for shedding some light on current plans and plans moving forward. I wrote the piece because Bruichladdich has been, to me, one of the most intriguing brands to watch. I was really excited by the Laddie Ten release. And, I’ve constantly been impressed by the innovation. But, as a consumer, I’ve also been at times confused by where to go next with the line. My impression was that there was a distinctive line being drawn in the sand between the old stocks and the product produced under the new ownership. So, I’m glad to hear that is the case and that the plan is to continue moving on the path of distinctive brand lines. I think it makes it a hell of a lot easier for the consumer to understand. Lastly, in regards to my point about peat, I was not aware that nearly 50% of production on Islay is now un-peated production. So, I appreciate you pointing that out. But, I think there is still a consumer perception of Islay and peat. Perhaps the way you’ve addressed it on current bottles and the (very cool) website will help consumers start navigating the bruichladdich line even better moving forward. I would argue the main reason why *some* consumers might be confused are some lazy marketers rehashing the long outdated Islay = Peat concept again and again and again. Bunnahabhain hasn’t been peated for a long time while at the same time peated Highland malts have been out for quite some time. As far as I’m concerned the “whisky regions” concept could happily be moved to the dustbin of history (don’t think the recycling bin can be used here) sooner rather than later. Hopefully soon followed by the tartan and shortbread tin style of marketing.